The RS-NOR latch in Minecraft Redstone is sometimes called a memory cell because once a signal activates one input, it stays activated until a different signal is sent to the other input. However many times you press that button, it doesn’t change the output until the other button is pressed. The R stands for reset, and the S stands for set. NOR is a logic gate — the output is off when at least one input is on. If you’ve ever worked with electronics, this concept may be familiar to you. This step creates one input. Place 2 redstone dust parallel to the torch. Refer to the darker red dust shown. 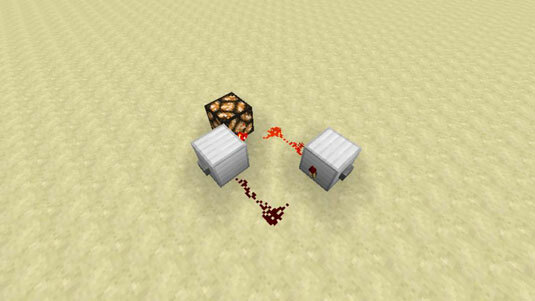 Place another block at the end of the redstone dust trail with a redstone torch on the side of that block. This step creates the second input. Place 2 redstone dust next to the original block that you placed. Refer to the lighter red shown. Place buttons on the side of the blocks (though other input mechanisms would also work). To operate the RS-NOR latch, press the button on the block that has the lit redstone torch, thus turning off that torch and turning on the other one. In the figure, the glowstone lights up only when the redstone torch next to it is lit. If the button on the block of the unlit redstone torch is hit, nothing happens. That is the power of an RS-NOR latch.